There was some discussion about a daily challenge and it was suggested to try a weekend challenge instead. 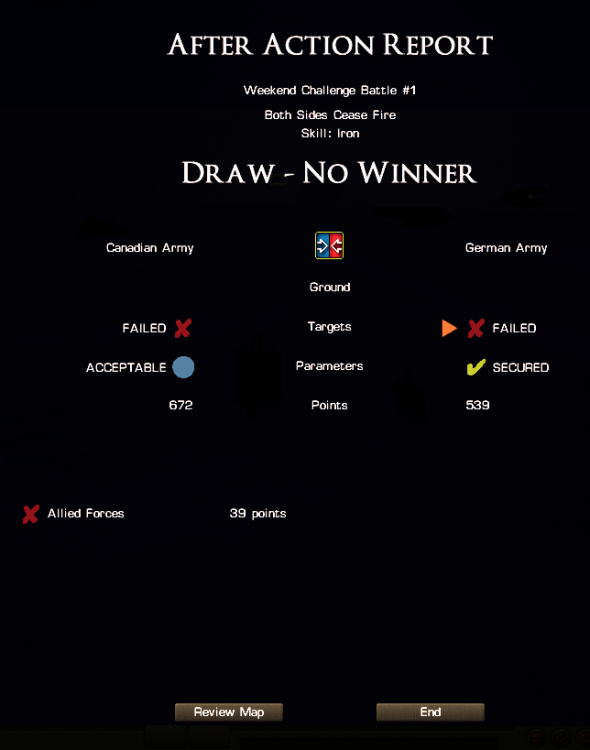 So here is the first weekend challenge battle. It is for CMBN, will require the Commonwealth module and the Vehicle pack. The battle is to be played as the Allies against the AI. This battle features a recon element scouting out a potential route for a major assault. It requires the player to be very conscious of their own casualties. It is 40 minutes in length and features a Canadian Recce Troop. The goal will be for players to have 72 hours to post a screen shot of their results, so 9 pm EST Monday, Feb 4th is the deadline. For your results to count, the battle must be played WEGO and in Iron mode. If there is a active participation of these challenges, the player with the highest combined score at the end of February will receive a package of heirloom tomato seeds (subject to international agricultural export rules). Sounds interesting, any chance for a version without the vehicle pack requirement? But the truth of it is, here is the truly blind score, playing it the first time and truly not knowing what I was getting into. So As you can see, I played it three times. Anyone can dissect a situation until its not a challenge at all. In my world, only the first score matters, because there is no do overs. The second score is playing it again without trying to risk my units for the sake of a score. The third time was with the knowledge of your AI plan and scoring from the first two effort and then going in with the intent to get a perfect score. And it was done. Not wanting to be a jerk about it but the format lacks a way to be a good challenge for comparison, there will always be someone that will do what it takes to get such a score. Just showed you how easy it could be done and there is plenty of ways to even make it easier. but I was not going to mention all the cheap methods to take the challenge out of it. Can't understand why anyone would want to replay a scenario just to get a Total Victory score. Says something about the personality. Not sure what. I see your point, it is a flaw I overlooked while thinking of this idea. Thanks for your honest feedback. I do want to say, it was a good challenge. well designed. I focused on the whole map the first time, which is what one should do with the task on hand, then at the end, I was in a little rushed and lost three guys in a unlucky event. 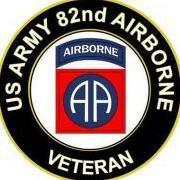 that cost me the task of keeping my casualties light. The lost car was to a AT gun that I had not spotted and the car had pulled to a location to support some infantry in trouble in the first go around. I enjoyed the challenge on the first go around. The third time, not only does one not waste any time with having to anticipate where the enemy is. , but the armored cars were used to remove each defensive asset one at a time with personal exposer to that threat only. once the main threats were gone , it was pretty easy to mop up the whole map. None of that battle would ever have happened playing it the first time blind. There would be no way for me to understand to use my units thus and if I did figure it out, no way would I have the time. I agree with you as too, not getting into replaying a battle much, I only enjoy the first event, the real test of the unknown. But it does work as a way to test tactical choices one has made, so I don't blame anyone for going back and testing options, But that only is of a benefit if you control yourself and play the situation as if you have none of the knowledge you now enjoy. Its also a needed skill if you are making scenarios, you have to test them many times, but you have to move the units as if you have never seen the situation before or have any knowledge of where the enemy is. Nice scenario for the Sunday afternoon, the result after the first approach. The scenario is not too difficult. -axis training a little low, regular / green. It causes that they quickly run away from any shot. Well that was disappointing. Draw. I had troops across the river on the right, knocked out 2 AT guns, 2 MGs, and got credit for none of them. No friendly casualties. Not sure what happened, but I think I did better than a draw. Oh, well. On to the next challenge. Totally agree, The best scenarios have multiple AI plans so a player could face a significantly different situation the 2nd or even 3rd time depending on how many AI plans there are. Wish there was a way for the system to "know" which AI plan a player has experienced so one is sure to face a new one. It's horrible replaying the same exact situation/scenario. Based on your results, I would have expected a different outcome. I have sent you a PM to see what may have occurred. Examining the score screen only: I think it was telling me I did *not* score for spotting the enemy only eliminating them. That's not what the briefing said. Pretty fun scenario. Don't get me wrong I had a good time. My feedback would be that a total victory should have been possible by following the briefing. 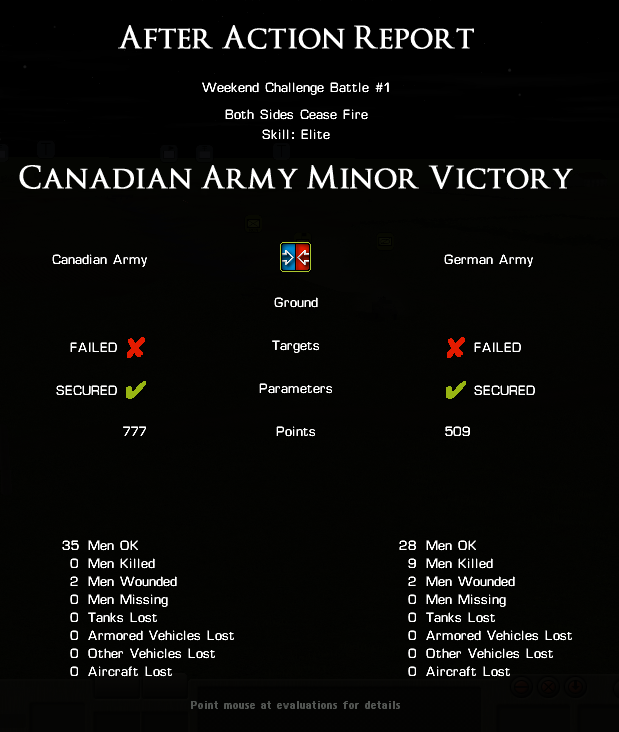 Up until the Minor victory I was playing like I would have approached it IRL. After that I switched to a much more aggressive posture that was not really appropriate for a scouting mission. I played blind without reading this thread in any kind of detail and the only reload I did was just to continue and I never looked at the battlefield in between. Actually I still have not looked at the battlefield so I don't know for sure if I took out every enemy. I just downloaded the file from the link so I had the same one you all did. Just to make sure there was nothing different on my machine than yours. When I loaded the file in the editor the parameters are still exactly as they should be. This scenario is set to score the three AT guns and two MG's as spot objectives. They are each worth 80 points for a total of 400 points, so I would assume you should have scored higher than half those points based on your statement of success. Would you happen to have a final screen picture of the breakdown of points on the targets section? You kept casualties to less than 15% so you scored the full 500 points available for success there. 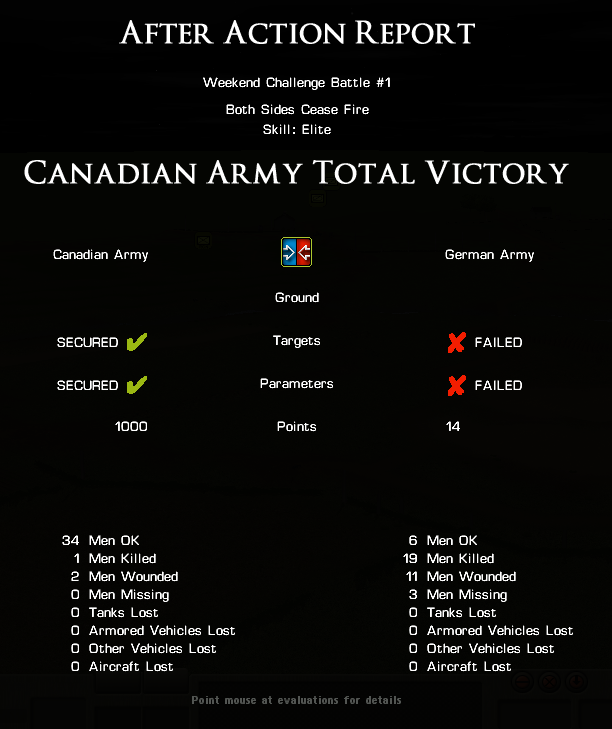 The remaining 100 points is awarded for causing greater than 15% casualties to the enemy. Again, based on your posted results, 11 K/WIA out of 39 or 28%, you should have scored the full 100 points. Something seems off to me. I would think you should have been awarded 600 points plus far greater than half the spotting points giving you a total of at least 900 out of 1000 points and more than enough for a major victory. The Enemy AI scores points based on self casualties below 50% of 500 points and a further 500 points for destroying your units. Since you kept your losses very low, they should have scored minimal points but since their loses of 28% were below the 50%, they claimed the full 500 points. What would you change about the described scoring or the briefing to better reflect the results you were expecting? it's on we will not have tomato seeds .. I just tested it again - just moved one team to spot an AT gun and cease fire. No points were awarded for spotting the gun. Hummm. @Heirloom_Tomato and I are in a PM conversation about what's up. do you have something for this week?